I know what my dream car is now! 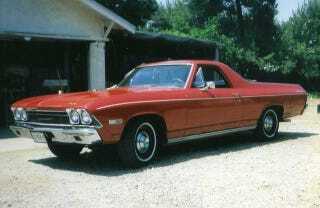 Buy an El Camino. Get rid of the air shocks for gas shocks and add an air helper spring so it can still take loads. Do some other small modifications with the suspension, bushings, swaybars, etc. Throw in some A/C (if it doesn’t have it) and a mildly built V8 (again if it doesn’t have it.) and a five or six speed manual. And if the budget allows a LSD and new paint job. Then it’d be the best car ever! It’d be a ball to drive and you could use it as a truck, all in the comfort of A/C! Now I just need to get a job that’ll pay well enough for me to have a house with a garage, pay insurance for two cars and all the parts, and have enough time off to do everything to it!